Safely unlock your Kyocera with doctorSIM. 100% online, your cell phone remains with you at all times. How to unlock my Kyocera phone with doctorSIM? Unlocking your Kyocera cell phone is as simple as 1-2-3! All you need to do is submit your request from the convenience of your home or office, choose from one of our 100% secure payment methods and then type in the unlock code we send you via e-mail to complete the process. What do I need to unlock my Kyocera? You need your phone and access to the keypad and drop-down menus. You will also need to be able to pay using one of our many payment methods and have an e-mail address where we can send you the unlock code and instructions to complete the unlocking. Do I need to specify the model of my Kyocera phone to unlock it? No, because the instructions on how to insert the unlock code are the same for all Kyocera models. The only difference is the unlock code for your particular phone which is based on its unique IMEI number. This number can be obtained by typing *#06# on the phone's keypad. Although you do not need to know the model of your cell phone to unlock it, if you need that information for any other reason, for example, you want to sell it, you can find out by using our identify Kyocera model check. How many unlocking attempts do I have to unlock my Kyocera? 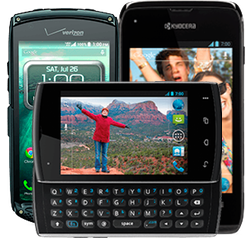 Kyocera cell phones have unlimited unlocking attempts so you don't need to worry about accidentally typing the code incorrectly. However, we recommend avoiding cheap and untrustworthy online unlocking service providers because they sell codes which don't work and could easily damage your phone. How much does it cost to unlock a Kyocera phone? Permanently unlocking your Kyocera with doctorSIM is very economical and you can check our current prices by selecting the country and network provider to which it is locked. As well as earning credits on every unlocking you make, you will also find discounts of up to 45% on our website. Yes, unlocking your phone with doctorSIM is permanent. You can also restore your phone to factory settings and download all official software updates without fear of your Kyocera locking again either to the original network or the new one. How do I find out if my Kyocera has been blacklisted? If you suspect your Kyocera has been reported or blacklisted due to theft, loss or non-payment, we recommend using our Kyocera phone check service to eliminate any doubts you may have. What advantages do I have unlocking my phone with doctorSIM? Convenience and full guarantees! Our method of unlocking is the method recommended by the phone manufacturers and network operators themselves, doesn't require software downloads or hardware alterations. With doctorSIM, you'll save time, money and effort, because you can unlock your Kyocera from the comfort of your home without having to send it anywhere. Unlocking your cell phone is 100% legal. Immediate refund if unlock code isn't available. No questions asked! Our unlock codes work for international travel in any country. doctorSIM's unlocking method guarantees you won't lose your warranty. We invest in quality controls and certificates to ensure the safety of your personal data. IMEI-based unlocking services are permanent unlike via cable. Pay for your unlock code using the payment method of your choice. Your Kyocera phone never has to leave your side. Top-notch customer support available through chat and e-mail. We are the premier unlocking company in the world.